Viking...aah screw it, Battle Metal! Turisas displayed some very interesting elements and abilities on their debut album, Battle Metal. The hearty vibes of humppa a la Finntroll along with slight black aggression thrown into a blood-thirsty HURRAAHH-storm of Viking Metal made for some very interesting and mostly entertaining listening. With The Varangian Way, everything the band accomplished on their debut is upgraded tenfold with marvellous results. The disc is a concept album. 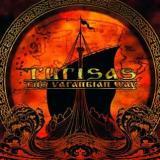 To find out more about the whole underlying theme, one needs only go to Turisas’ webpage to get a very thorough explanation. I will only say that as the cover art displays, the songs tell the tale of rough northern warriors setting sail for the bounties in the east. Their travels make up for some intriguing stories, with some special Finnish flavour added into the mix in the form of lyrics taken from our national epic, The Kalevala. Singer Mathias Nygård bellows his furious shout very strongly but can go for a subdued storyteller-croon just as well. Occasional growls are mastered as well. The band is tighter than Scrooge McDuck during an economic downturn. The production is powerful as well, especially when one considers all the bells and flutes and whatnot that is colouring the soundscape along with the traditional instruments. Despite the huge mass of audio, everything is balanced and sounding stellar. The album opens up with a grandiose blast as To Holmgard And Beyond lifts the sails and one can just feel the metal wind blowing strong as the insanely catchy chorus lingers its way into every corner of your cranium. The next two tracks mix up some excellent mellow, ethnic influences with Nygård going for an almost “reciting poetty”-feel with his vocals. The aggressive poundings work very well for contrast. Fields Of Gold (no, not a Sting-cover) raises the flag again with epic keyboards and horn sounds that make the blood boil – in a good way – with a spirited war cry. In The Court Of Jarisleif brings the humppa and “dance-bility” with manic accordions and a foot-raising thrash beat. Good times! I feel the final trio of Five Hundred And One, The Dnieper Rapids and Miklagard Overture truly packages the story and emotion that the whole record is putting across. The feeling is electric as the songs depict the anticipation of battle and raging waters thrusting against the side of a teetering vessel. Especially in the latter of the three songs the sense of victory after a gruelling journey is captured so well that one doesn’t even have to close their eyes to feel arms with swords and spears lifted high in the air while kegs of ale were rolled out from below the deck. The epic choirs are amazing and really uplifting. Slightly proggish elements can be smelled in the tempos and drum work. This record succeeds in what so many releases fail. It gets better and better until the end where a blow-out punch is given that leaves the listener floored as silence ensues. Epic! Actually, my only beef with this record is that it’s a bit too short! Battle Metal suffered from a few filler tracks that were in there with the very good songs. The album seemed a bit too long. The Varangian Way is so good that one wishes there were a few tracks more of this. Oh well, these eight brilliant tracks really leave you hungry for more, so I think the band succeeded with not putting more on here. The whole work is impressively strong on all fronts and I can’t wait to see if Turisas can actually top this in the future. All hail the men in red and black body paint!